Your family will love this 2019 Keystone Avalanche 321RS 5th Wheel, and you'll make vacation memories you'll cherish forever. Here at TerryTown RV, we want our customers to enjoy the best RV experience possible. That's why we offer super low prices and carry a huge inventory of travel trailers, 5th wheels, toy haulers, and more! 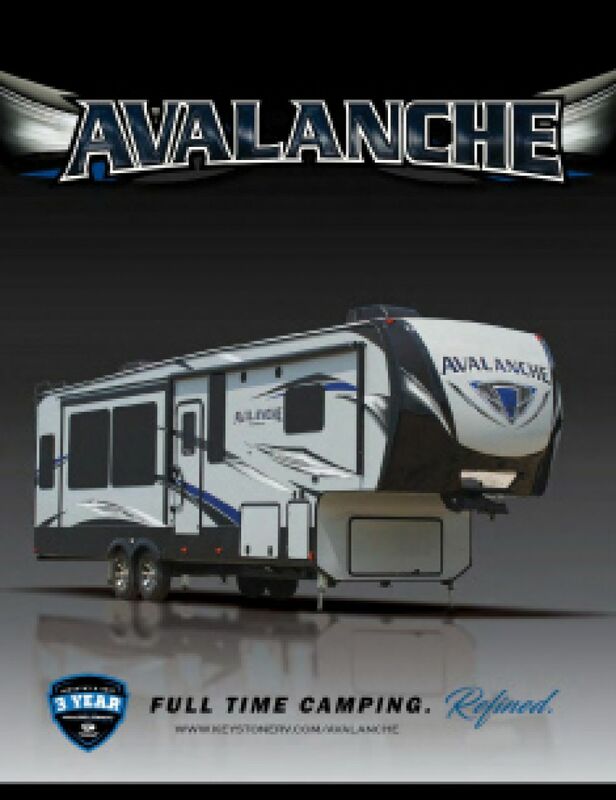 As a top RV dealer in Michigan, we're ready to put you in your dream 5th Wheel at a price you can afford! So stop in and see us today. We're conveniently located at 7145 Division Ave S Grand Rapids Michigan 49548. Not near your neighborhood? No problem. We have highly satisfied customers throughout the country, thanks to our fast, reliable nationwide shipping! Give us a call at 616-455-5590 and we'll make your dream of owning your very own RV come true! The 2019 Keystone Avalanche 321RS is built for easy handling on the road! It's 35' 8" long, 8' 4" wide, with a hitch weight of 2320 lbs. The 16' 0" patio awning provides shade and comfort for outdoor living. And with a rugged GVWR of 15000 lbs, this rig will give your family years of fun on the road! The living area stay nice and temperature controlled with the 35000 BTU furnace and the 15000 BTU a/c. This 5th Wheel has a length of 35' 8", a width of 8' 4", and a height of 13' 2". There are 3 slides that provide extra walking space inside! 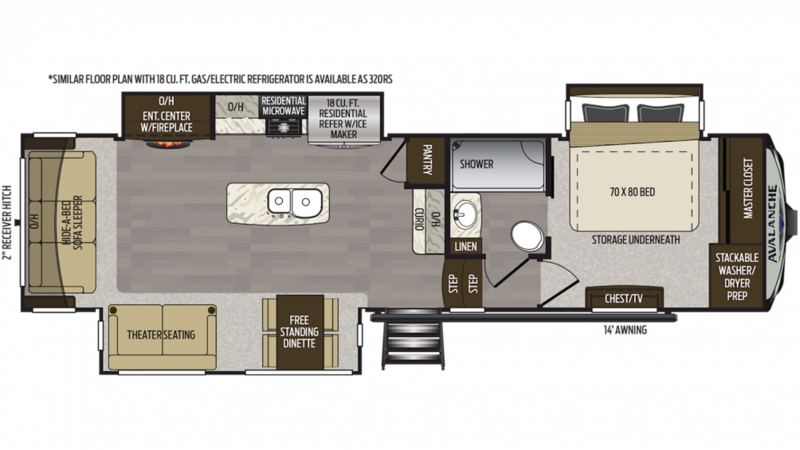 This 5th Wheel is large enough to sleep up to 4 people and one of the nicest accommodations is the master bedroom! It's roomy, with handsome furnishings for your clothes storage, and features a super comfy King bed! You'll enjoy a great night's sleep at the end of every fun-filled day! Have a bathroom conveniently located on your campsite with the RV's bathroom! Inside there is a Porcelain Foot Flush toilet and a shower, with plenty of hot water thanks to this model's impressive 60 lbs. of LP tank capacity! The used water and waste are stored in the 83 gallon gray water tank and the 49 gallon black water tank, respectively.